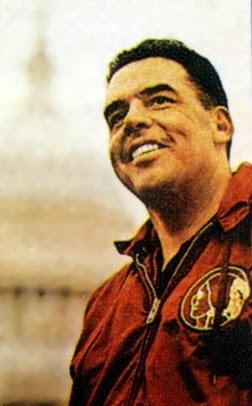 On January 25, 1966 it was announced that the Washington Redskins had hired Otto Graham, the Hall of Fame quarterback of the Cleveland Browns who had gone on to coach at the Coast Guard Academy, as head coach and general manager. The 44-year-old Graham replaced Bill McPeak, who was fired with a year left on his contract. Graham was signed to a sizeable contract that team President Edward Bennett Williams called the richest deal that had ever been given to a coach of the Redskins. He had turned down pro coaching offers in the past, reportedly by the Eagles, Colts, and Browns, as well as the University of Oklahoma, while remaining at his secure position at the Coast Guard Academy, where he led the football team to an undefeated season in 1963. He also coached the College All-Stars for several years, starting in 1958, and the story of his signing with the Redskins first leaked when he contacted the Chicago Tribune, the game’s sponsor, to resign as coach. The Redskins had not had a winning season since 1955 and had last appeared in a postseason contest ten years before that. In five years under McPeak, they had shown improvement but, after a second straight 6-8 record in 1965, Williams determined that a change was in order. In addition, under McPeak there had been disciplinary problems with many of the veterans, as well as widespread dissension. The team that Graham inherited had a fine quarterback in 32-year-old Sonny Jurgensen. Not surprising for an ex-quarterback, especially considering Washington’s mediocre ground game, Graham chose to emphasize the passing attack (although, unlike his mentor with the Browns, Paul Brown, he let Jurgensen call his own plays). Flanker Bobby Mitchell was well-established as a top receiver and Charley Taylor, who had started out as a halfback and was a fine receiver out of the backfield, was converted to split end during the season with even better results. Jerry Smith, breaking out in his second season, quickly established himself as one of the league’s best pass catching tight ends. Jurgensen led the NFL in pass attempts (436), completions (254), and yards (3209) and ranked second in TD passes (28) in 1966. Taylor, Mitchell, and Smith all finished in the league’s top 10 in pass receptions, with Taylor ranking at the top with 72 while Mitchell had 58 and Smith 54. Taylor’s 1119 yards placed third and his 12 touchdown receptions tied for second with Cleveland’s Gary Collins. Mitchell had 905 yards and 9 TDs and Smith contributed 686 yards and six scores. The running game remained a problem, however. HB A.D. Whitfield, acquired from Dallas, led the team with 472 yards on just 93 carries for a healthy 5.0 average. But veteran fullbacks Steve Thurlow and temperamental Joe Don Looney were found wanting. Mitchell, formerly a halfback with the Browns, was briefly moved back to that position in an effort to generate a ground attack. In any event, the revamped offensive line had a rising star in center Len Hauss. The defense contained seven new starting players. The line had talent in DT Joe Rutgens and DE Ron Snidow. Veteran linebackers Jimmy Carr and Bob Pellegrini retired to take assistant coaching jobs, but John Reger was talked into staying for another year and MLB Sam Huff, in his third season in Washington after a distinguished career with the Giants, also remained. Second-year OLB Chris Hanburger emerged to become a star, most notably as an outstanding blitzer, and was picked for the Pro Bowl. While FS Paul Krause was the biggest star in the backfield, rookie SS Brig Owens led the club with seven interceptions. Another key newcomer was PK Charlie Gogolak, the team’s first draft choice out of Princeton. Brother of pioneering soccer-style kicker Pete Gogolak, he brought the same then-novel approach to placekicking to Washington and had a fine rookie year, booting 22 field goals in 32 attempts and scoring a total of 105 points. Overall, the Redskins went 7-7 to break even for the first time in ten years. They started off at 5-3 before losing three straight games, including a 31-30 thriller against the eventual Capitol Division champs, the Cowboys. They then defeated the woeful Giants by a whopping 72-41 score, the highest-scoring game in NFL history (but not one in which the defense distinguished itself), and then upset the Cowboys in Dallas by a 34-31 tally. Improving the ground game was a priority for 1967, and the Redskins used their first draft pick to take 240-pound FB Ray McDonald from Idaho. Inserted directly into the lineup, he suffered through a disappointing, injury-wracked season and gained only 223 yards. Once again, A.D. Whitfield led a mediocre running game, with 384 yards on 91 carries, but he also caught 36 passes for 494 yards. The passing attack, if anything, got even better than it was in ’66. Sonny Jurgensen (pictured at left) topped the NFL in passing while setting a league record with 3747 yards through the air (over in the AFL, Joe Namath of the Jets passed for 4007 yards). He also set new league standards with 508 pass attempts and 288 completions and led the circuit in TD passes (31) and lowest percentage of interceptions (3.1) while his completion percentage of 56.7 ranked second. Receivers Taylor, Smith, and Mitchell placed first, second, and fourth – in that order – with 70, 67, and 60 catches, respectively. Taylor gained a sixth-ranked 990 yards and Mitchell placed ninth with 866 while Smith had the most scoring catches of the group with 12, which was second only to New York’s Homer Jones. However, for all of the aerial excitement, Washington’s record regressed to 5-6-3. While the Redskins again played well against the division-leading Cowboys, and upset them once more at Dallas, they also were embarrassed by the expansion Saints, 30-14, and could only gain a tie against the 1-12-1 Atlanta Falcons. While the defensive line was still effective and Hanburger again played the one outside linebacker position with distinction, other than Krause (8 interceptions) the defensive backfield fared poorly. In addition, Gogolak was lost to a season-ending injury in the first week and the kickers who replaced him were a combined 6-of-22 on their field goal attempts (the best was ex-AFL star Gene Mingo, who kicked a team-leading four in 10 tries). Sam Huff retired after the ’67 season, and that left a big hole at middle linebacker in 1968 (he would return to the team in ’69). Graham also traded Paul Krause to Minnesota before the season in a deal that would prove more beneficial to the Vikings. 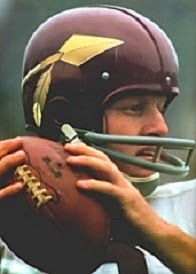 Sonny Jurgensen had a sore shoulder, and his performance suffered accordingly as his passing yardage fell to 1980 and his touchdown total to 17. Veteran backup Jim Ninowski started two games while rookie Gary Beban, the Heisman Trophy winner out of UCLA whose rights were obtained by the Redskins from the Rams at the price of the first draft pick in 1969, was a flop at both quarterback and running back. Charley Taylor and Jerry Smith were still quality receivers, although Bobby Mitchell, at age 33, dropped off to 14 catches. The running game continued to be a problem. HB Gerry Allen led the team with 399 yards, but averaged just 3.2 yards per carry, and of any backs who carried more than 30 times, Steve Thurlow had the best average at 3.6. The defense still had too many holes, too. Joe Rutgens, still the best of the linemen, was showing wear. Hanburger continued to be outstanding at linebacker, but no one could adequately replace Huff. Ex-Cardinal CB Pat Fischer was a good addition to the defensive backfield, and Brig Owens bounced back, but rookie Jim “Yazoo” Smith, the first round pick out of Oregon who replaced Krause at free safety, was not as good and then suffered a neck injury in the season finale that finished his career. Gogolak was back to handle the placekicking, and while better than the group from 1967, was not as proficient as he had been as a rookie. Overall, the effect was a disappointing 5-9 record and Graham was replaced by Vince Lombardi, lured away from Green Bay where he had retired as head coach but was still the general manager. While the Redskins had been an exciting offensive team during the Graham era, the failure to improve the running game and the problems on defense ultimately rendered his tenure a failure. The overall record for the three seasons was 17-22-3. Graham returned to the Coast Guard Academy, where he served as athletic director until retiring.